I am sure Shahrukh has patented Raj :)....my husband Ashok says that its very unfair that the bad guy always ends up being called Ashok in many tamil movies and that too, noone says it right most of the time (its asog or asok...) ! Oh man, that was one of the very few things I din't like about this movie. The hero's name. Karthik is a veryyyyyyyyyy common name and I would want directors to chose something apart from the regular ones. Watched both the movies TVP and VTV. The dialogue delivery in all the three languages English, Tamil and Malayalam give an impression it is done by a native speaker. Also, your voice very much suits the contemporary matured girl. Congrads Chinmayi, a great job once again. I sincerely believe that is an issue. Naming a person. In movies, my view is that, a hero's name should be simple. The guy next door kind of a simple name.. karthik- works everytime! But, for me, name should be real simple.. I ve too much trouble with my name! For some strange reason, no one bothers to say my name right! "Maa-than-gi".. is that soooo complex? "madanki","mathaaangii","mathaji","mathangini","maaadangeee"- these are some of the various versions of my poor name! The worst one was "Mandakini"! I wish Gautham Menon had chosen a different name for Simbu's character. He came up with good character names in Khakha Khakha : Anbuchelvan, Maya, Ilamaran,,,. I heard your voice first time while watching surya s/o krishnan. at that time i thought sameera reddy herself had dubbed her voice. Atleast i got the chance u calling my name through the films. வீட்டுக்கு முன்னாடி நிறைய கார்த்திக் வந்து நிக்கப்போறாங்க! பாட்டு பாடுற மாதிரி, அப்படியே ஒலிம்பிக் தடகள போட்டியில் கலந்துகிட்டா ரெண்டு பதக்கமாவது கிடைக்குமே! இந்தியாவும் உங்களை கொண்டாடும்! Its so funny to imagine of the time you had. Happy aah? It makes me remember of a office incident due to our habit of swiping in and out even while entering the house i use to swipe and enter.....its funny. Hi Chinmaye, I din't know the voice over was yours for a few of the films until I read about that in your blog. I believe thats the success one can get as a dubbing artist :-) Keep it up! By the way, one small suggestion. The text font in your blog is not so reader friendly; probably due to too less vertical spacing (i.e., line-height is less). It would be easier to read if that is fixed. நாமத்தில் மட்டுமல்ல நமக்கும் இருக்கவேண்டும் என்று! Saw VTV over the weekend.. Nice expressive voice given by you for Trisha.. Such a big difference in your voice between singing a song like 'Anbil avan' and the soft but matured voice for Trisha..
nalla velai.. Mall la engayavadhu poi Karthik nnu yaaraiyum koopidalaiye..
A gal pal of mine watched a clip of VTV and she said that Trisha's voice was super attractive.. I mean it was the first thing that she/I noticed which stuck out for both of us. She was surprised to hear that it was your voice..I'm not sure if you know this..(lol), but your voice is pretty damn good! I like the fact that you are venturing out to do other things, not sure if that's the norm in the industry, but ahmmm more power to you.. Totally unrelated comment.Need a favour if u have the time. I have been trying to find the notes of the raja song "kaatril varum geethame" from oru naal oru kanavu. Checked TFM notes but it ain't there. Where can i find the notes?your help wud be greatly appreciated. I was just telling my brother about the same thing today - how, when i watched vtv, i suddenly thot of tvp and when u said gautham in kanden kadhalai u reminded me of bhoomika from jillinu..Nice job. The malayalam sounded very interesting to me! Haha! It's funny - I was just telling my brother today about how you saying Karthik in VTV reminded me of TVP (watched that barely a few days ago), and how tamannah saying Gautham in Kanden Kadhalai reminded me of Bhoomika saying that in Jillinu oru Kadhal! Nice job with the dubbing (you're one of the very few with a good accent and not monotonous). Well done with the malayalam part as well! netru office learnthu vittukku varumpothu unga pattu vanthuruchu. Anbulla manna from pokkisam..
intha ponnu mattum eppadi ippadi ellam paduraelnnu ninachuttu vanthaen.. Amazing voice..
some of the dialogue , way u pronounced was amazing..
way of smiles during dialogues. Thanks for being Jessie in YMC. Congrats! Hey thanks for ur performance in VTV. Without u or trisha, jessie is not what she is now. Not gettin enough of her even after watching n times already..
Only some people are really gifted.your voice is magnetic.Most of them who watched vtv would definetely have been attracted by jessie's voice.i think that her voice ly makes her that special.although people are gifted with many mind blowing talents they ought to be hardworking to reach the sky.probably you are one of them.rock the world! Oh ho.. so many things to say for u. Anyway have great busy time ahead. By the way ur rendition of "Anbil Avan" in Vinnaithandi Varuvaayaa was just excellent. Me hearing it almost all day. The song just's giving me some kind of magical energy. 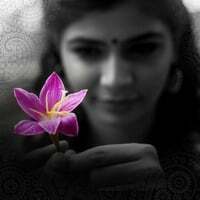 Thanks for the song (Rahman) :) Keep it up Chinmayi. Ha Ha Ha..thats really funny,it has become monotonous hearing names like raj,rahu,karan, prem,priya etc..need a change. Hi I used hear to varaiyo varaiyo song atleast twice in a day during my journey to office. My two of my friends also become a fan of u after hearing that song.Superb voice in VTV also.Good pronouncations in tamil. Chins who's voice(female) in hosanna song..is it u? this is me[nAREnDRAn]from here[Chennai],and this is my 1st attempt to breakup with my profession of being vetti and start writing my views.I chose this interface to type due to various reasons. Happaaaaa.... i came to the topic of calling karthik...karthik...All because of Mr Many rathnam . he gave this name to the character in ALAIPAYUTHEY. This character has some influence from the role of actor karthik in MOUNA RAAGAM. And no wonder simbu is a big fan of that movie alaipayuthey . Gautham vasudev menon ,an engineer and i guess he has worked with Mr.Mani. And all the more CHINMAYEE voice was heard by evry1 for the first tym in his movie . Me as everyone is a great fan of ur voice.. Just reminded me the Bollywood movie name "Karthik Calling Karthik" with your description.. But down south adha maathi it will be "Chinmayee calling Karthik"..
posts you have written that thaamarai has become very close to you. Can you please help me out to understand the exact context of this line. Reason: Many tamil movies which had hero's name as Karthik were/are hit. Karthik means courage and happiness, this sentiment have touched bollywood too "Karthik Calling Karthik". Expect few more movies with Karthik name in future. I like the way you pronounce "Karthik". Your voice is rocking. in 2 seens of VTV, ur voice is extreme great. i have never heard such a great voice. I have lot many dilogues but i love one of them most is "Nenu alaa anlaa "from Ye Maaya Chesaave.